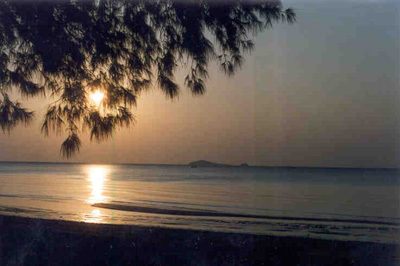 Hat Wanakon is the 18th and currently newest Marine National Park in Thailand (1995). It was opened by royal decree on 30th December 1992. 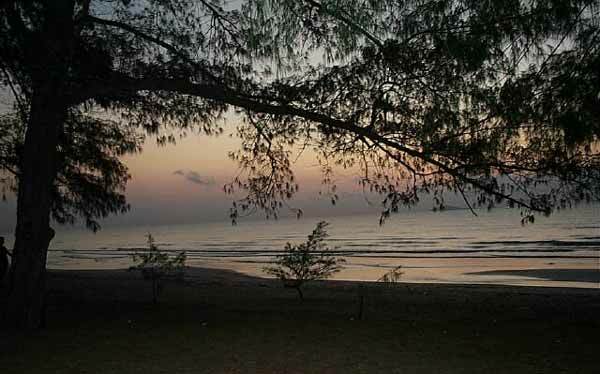 The park covers a total area of 38km2 which also makes it the smallest Marine National Park. 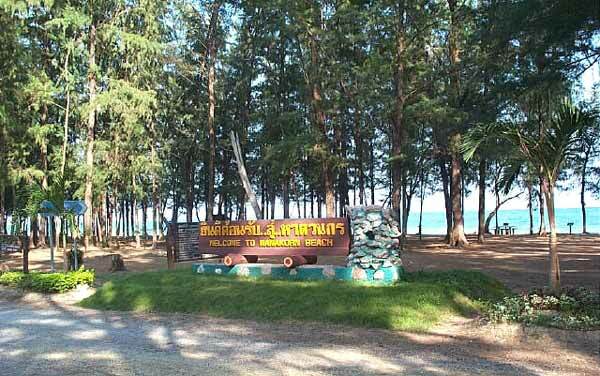 The park is relatively close to Bangkok being 315kms south. 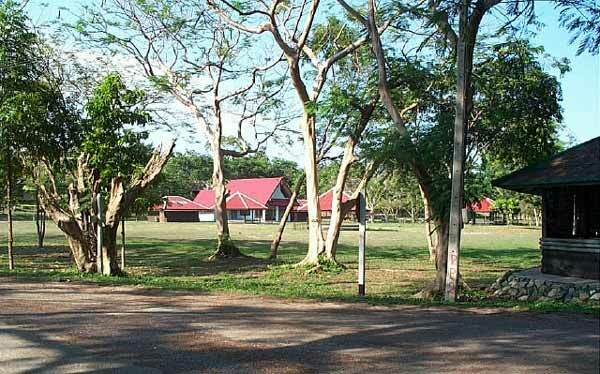 Prior to becoming a National Park, Hat Wanakon was an Arboretum and Silviculture Station, and has long been associated with forestry. 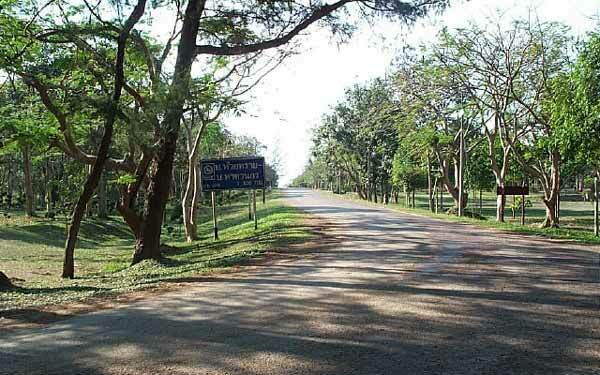 The park consists of a terrestrial and marine section, the landward part (59.5%) is dominated by beach forest and plantations. 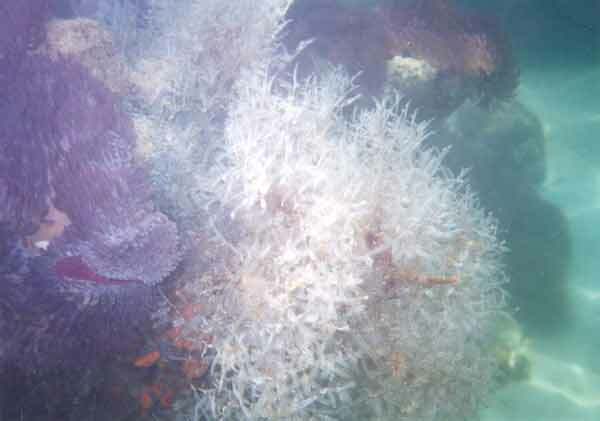 The marine section (40.5%) is nearshore sandy beach and the deeper water surrounding two islands 6km offshore. 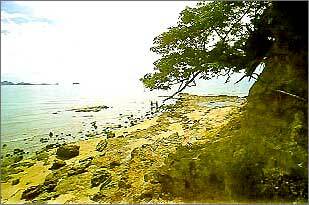 The islands offshore of Hat Wanakon were created in a most macabre way according to a local legend. Once upon a time there was an old couple who had a young beautiful daughter. It occured that she was courted by two young men. One was a chinese boy who was of royal decent, the other a local boy from Phetchaburi. One of the suitors approached the father about marrying the daughter, while the other approached the mother. The parents did not realise that their daughter was being courted by two different men. On the day of the wedding, the two grooms arrived at the same time and this caused much trouble. The mother and father argued about which one should marry their daughter. The arguement was so heated that the father became very angry. He then blamed all the problems on his daughter. He was so angry he grabbed her and tore her in two (possibly half for each of the suitors)! 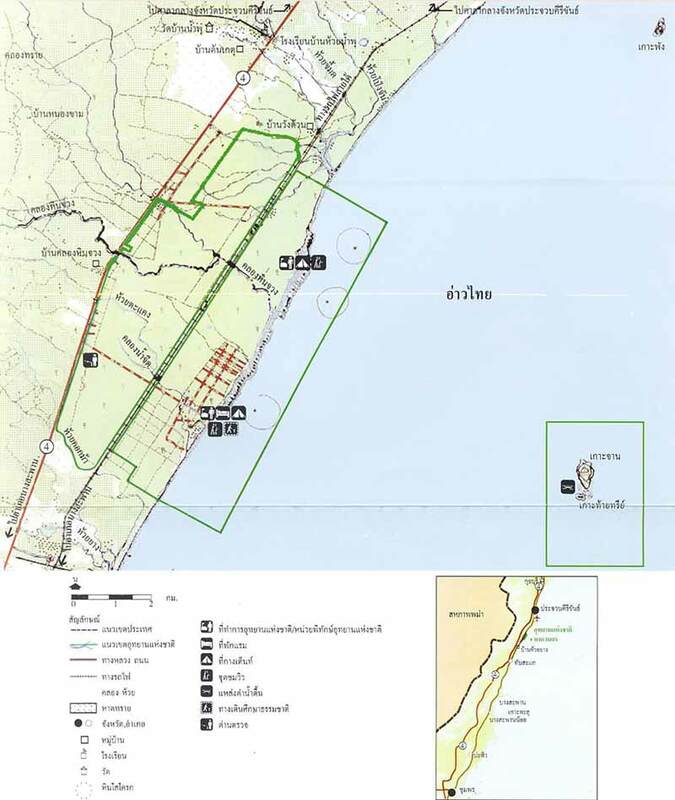 One half he threw to the north, this part fell into the sea just offshore of Khao Sam Roi Yot to form Nomsao Island the other half he threw east and it fell into the sea near Chonburi to form Nomsao Island. (The Thai word Nom means breast and the word Sao refers to a young girl!). 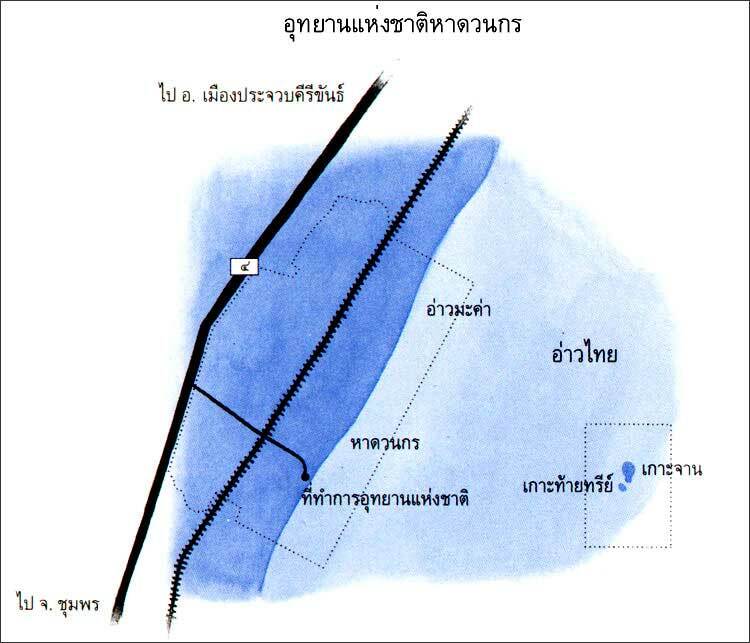 The wedding presents the father threw into the sea offshore, and today they form Chan Island and Thaisi Island. 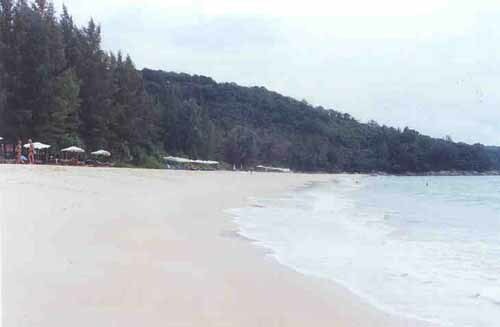 Hat Wanakon is located on a narrow coastal plain which stretches from the mountains of the Tennessarim to the gulf of Thailand. The deposits are of Quaternary origin and consists of layers of material laid down in horizontal beds. The deposits are dominated by Quartz sands, with a partical size ranging from sand to pebbles. Some of the beds also have sandstone rock fragments. The particals in the beds show a degree of rounding probably produced by fluvial action. The degree of rounding, <40% is quite low and indicates the deposits are youthful, probably only having been transported the 11km from the mountains inland. These deposits can be clearly seen forming the cliffs surrounding Makha Bay. Forest resource in the Hat Wanakon National Park is the mixed forest and generally, it's tall forest consists of bamboo, mikey tree, yang na, oramosia and pterocarpus. 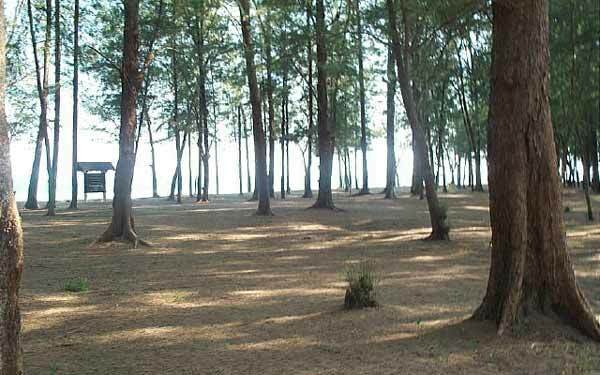 The former forest in the Hat Wanakon National Park is the replenished forest mixed together with recovered natural forest and replanted tree such as myrtle and lagerstroemia etc. Wild animals were founded totally 61 types, many are edible-nest swiftlet, other wild animals are birds totally 48 types, and other kinds of 13 wildlifes such as jungle fowl, squirrel, treeshrew, lepus pequensis, skink, canis aureus, shake and porcupine etc. 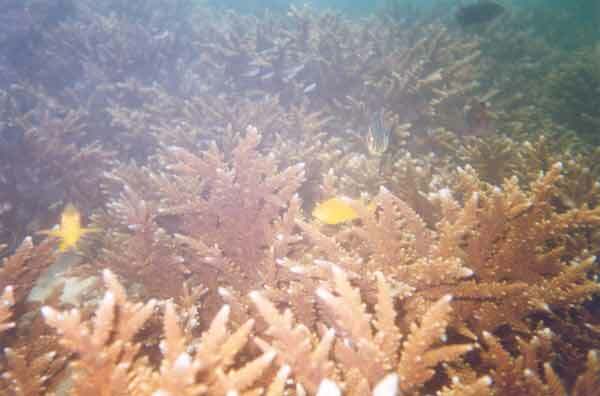 There are a lot of aquatic animals such as shrimp, fish, coral, turtle some kinds of dolphin. 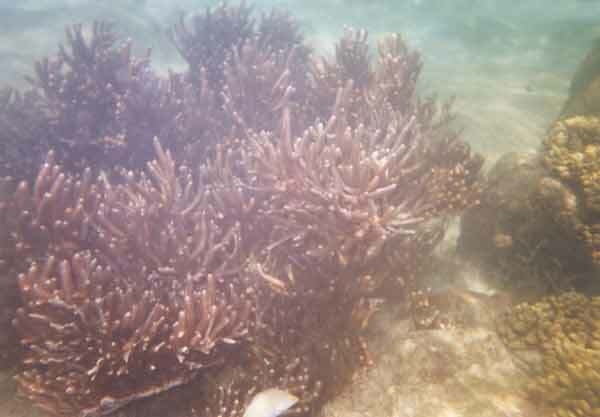 In addition, around Chan island and Tai Tsea island, there is some beautiful coral reef and in the ocean also found the source of sea grass e.g. 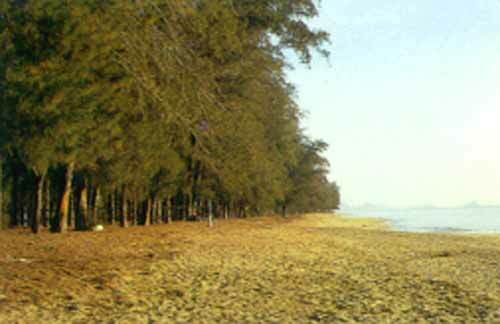 phom nang grass. 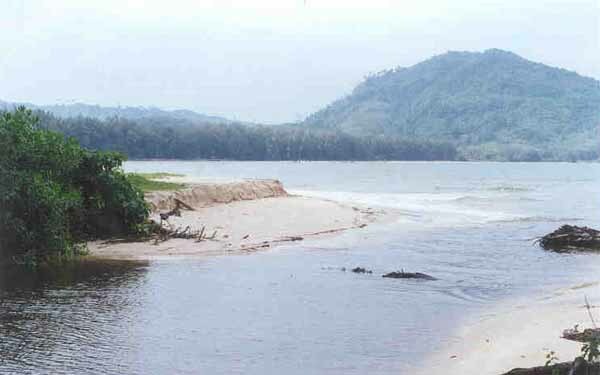 While some rock area and plain along a beach is the natural place for incubating and growing of mussels. 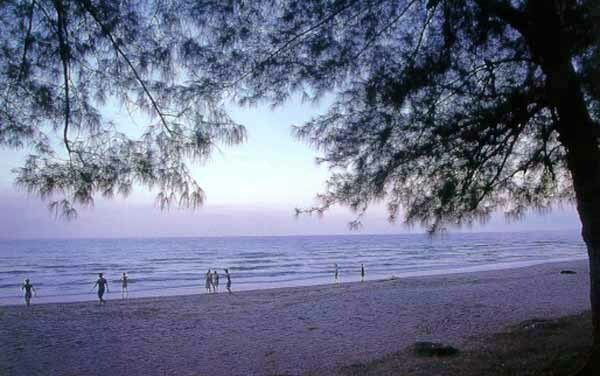 Wanakon Beach, is a popular daytrip destination with visitors coming to relax on the beach, go swimming and to picnic under the trees. The beach is very long and of clean soft sand. The water is suitable for swimming although care must be taken after heavy rainfall as jellyfish can occur. 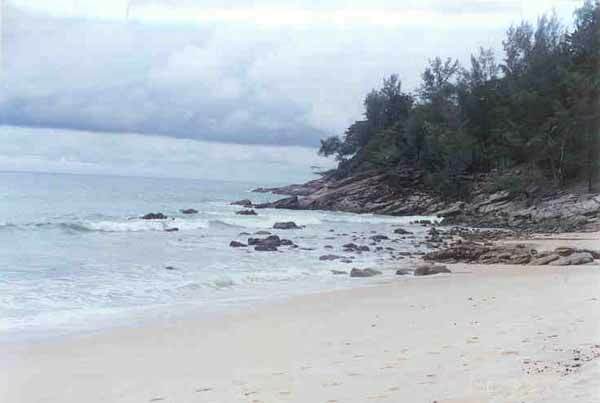 A 1km walk north up the beach is an area where rocks extend out to sea, a good place for observing marine life and snorkling. Makha Bay viewpoint, is located on the two headlands surrounding Makha Bay. 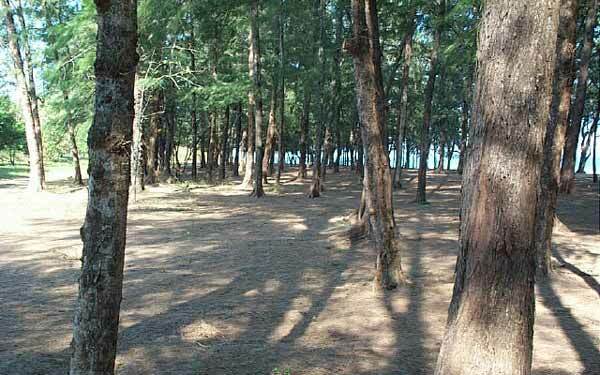 They can be reached by either walking the 4kms along the beach or follow one of the trails through the plantations. The second viewpoint is reached after a further kilometer. There are picnic benches and shade provided by trees. The views across the bay and out to the islands are very picturesque. There is a 100 meters white sand beach and coral at the end of the island. It has two caves here which live by many thousands of swallow birds. Drives on the road no. 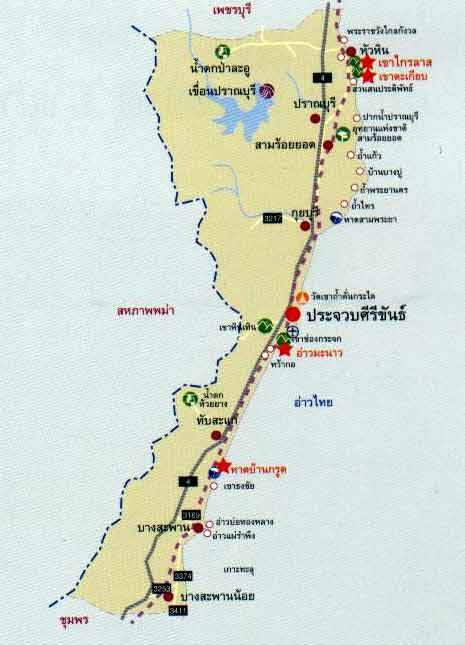 4, Petchakasem, from Bangkok to Prachub Kirikant, about 345 kilometers long, to Amphoe Tam Skare where far from Prachuap Khiri Khan Province about 23 kilometers. You can take a train at Wang Duan station or Huay Yang and then get a car or a motorcycle taxi. Takes a normal bus from Bangkok to this national park which costs you about 150 baht or by a air-conditioning bus which costs about 210 baht.